The Fourier series is a powerful mathematical tool, and it applies to multiple branches of engineering and mathematics. The design of a frequency tripler is a good example of the Fourier series in action. For computer and electrical engineers, the Fourier series provides a way to represent any periodic signal as a sum of complex sinusoids via Euler’s formulas. The purpose of the frequency tripler is to output a sinusoidal signal with a frequency that’s exactly three times the frequency of the input sinusoid. The circuit design for the tripler uses radio frequency circuit design principles, but the theory of operation is firmly rooted in signals and systems theory — the Fourier series modeling, to be exact. The action of the limiter circuit, which is a nonlinear system, is to clip the sinusoidal input and convert it to a square wave. The function sign() in Python acts as an ideal limiter because it outputs 1 when the input is greater than 0 and –1 when the input is less than 0. A square wave contains only the odd harmonics due to the odd half-wave symmetry property. Here, 3f0 is of specific interest. 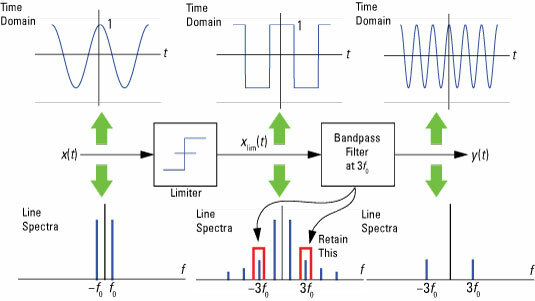 The band-pass filter, centered on 3f0, allows you to keep the 3f0 term of the Fourier series and reject harmonics at other frequencies. Mathematically speaking, the frequency response of the band-pass filter will pass signals only in the vicinity of the center frequency, which is 3f0 in this case. The limiter needs to clip symmetrically to ensure odd half-wave symmetry. If odd half-wave symmetry is destroyed, even harmonics appear, and even harmonics are difficult to remove with a practical band-pass filter design because the second and fourth harmonics lie closer to the third harmonic signal you want to retain. Therefore, this is a band-pass filter design issue you want to avoid. A small deviation from odd half-wave symmetry is acceptable because the second and fourth harmonics remain small.